5 Ways to Celebrate Christmas and New Year’s in Campania! From holiday lights to traditional nativity creations, visit southern Italy’s region of Campania to enjoy Christmas and New Year’s in Naples, Salerno, Sorrento and the Amalfi Coast. 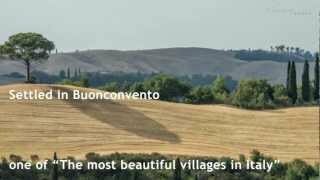 Christmas is a special time to travel to Italy, and each corner of the peninsula has traditions to discover. 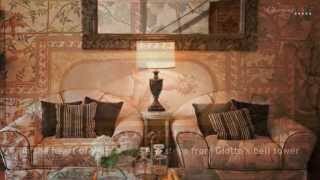 In the region of Campania, travelers can get into the festive spirit while holiday shopping under the Christmas lights in Sorrento and on the Amalfi Coast, find beautiful examples of nativity scenes--an important Neapolitan tradition--ring in the New Year with grand firework displays in Naples, Salerno, Amalfi, and so much more. Here are five of the best ways to enjoy the Christmas and New Year’s holidays in Campania! 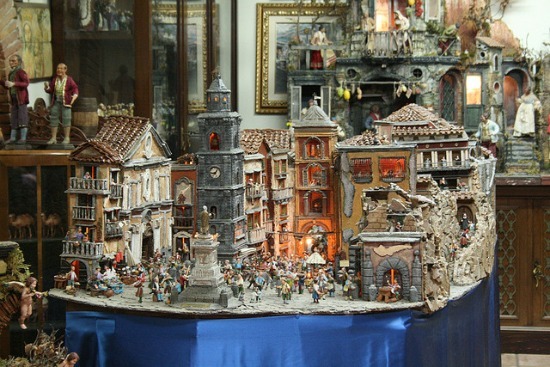 Naples has been famous for its handmade nativity scenes, called presepi in Italian, for many centuries. The tradition continues today thanks to the Neapolitan artisans who have passed down their skills for generations. Christmas is the perfect time to stroll down Via San Gregorio Armeno in Naples, a narrow street in the historic center lined with tiny shops and studios entirely dedicated to presepi. You’ll find traditional nativity figures in every shape and size, plus a cast of soccer players, politicians, musicians and celebrities from around the world. Be prepared for crowds during the holiday season, but that’s part of the fun! 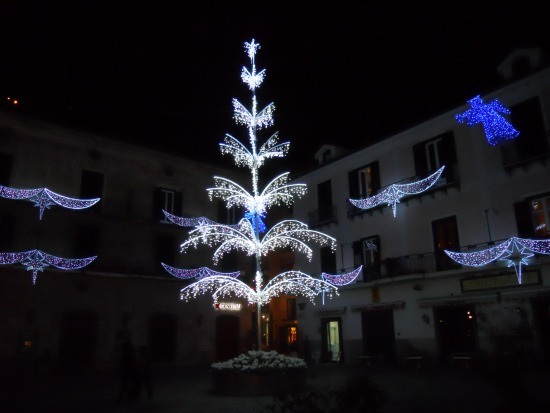 The city of Salerno has taken holiday lights to another level with their whimsical and creative Luci d’Artista displays. 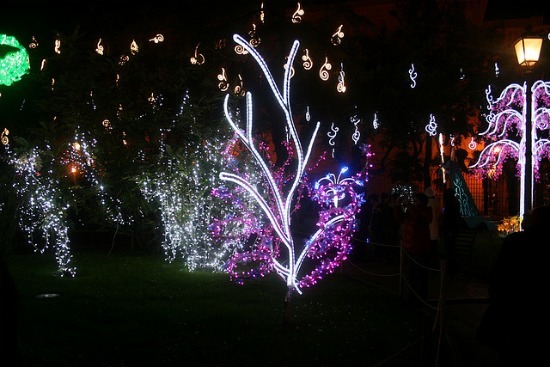 Stroll through the medieval streets of Salerno’s historic center through Il Giardino Incantato, The Enchanted Garden, where you’ll discover dragons and fairies surrounded but a world of colorful floral lights. It’s a magical setting for holiday shopping in Italy! Enjoy a drive on Italy’s famous Amalfi Coast road during the holidays to see the Christmas lights in each of the little villages on the coastline. Each town has a unique design every year, with some of the most elaborate displays in the villages of Amalfi, Minori and Positano. Another popular Christmas destination in Campania is the pretty town of Sorrento where you can join locals for an evening stroll and shopping under the holiday lights. 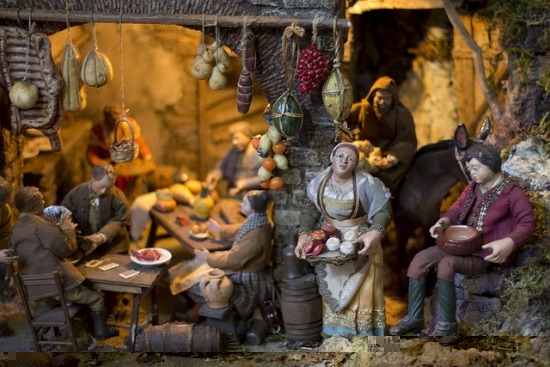 Capture a glimpse into the past by visiting some of Naples’ finest nativity scenes from the 1700s, including figures made by some of the city’s most important artists and designers. You’ll find magnificent presepi on display at the Certosa and Museum of San Martino, the Palazzo Reale, Church of Santa Chiara and the Royal Palace of Caserta. During the holiday season, you’ll also find many small churches open in Naples with nativity scenes on display. 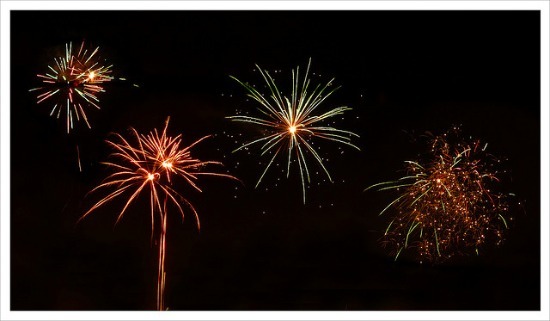 Celebrate the beginning of the new year in a very special way in the town of Amalfi, with an unforgettable firework display at midnight over the town’s harbor. Events, concerts and celebrations are planned for Christmas and New Year’s in Amalfi, making it a festive and charming location for celebrating the holidays in Italy. Follow us on Twitter and Facebook! Subscribe to our RSS and stay tuned! I will never forget my 1st Capodanno on the Amalfi Coast. The amateur fireworks rivaled any professional display I had ever seen. 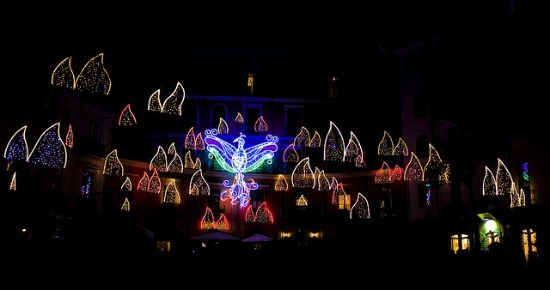 The Christmas lights in Salerno are second to none, an amazing display!